(Victor Valley)– I love coming across new anime and manga: I have been a fan of both art forms for years now. Sometimes, you get titles that are pure action, like Dragonball Z or Naruto, sometimes you get titles steeped in horror, or comedy, romance: any genre you can imagine. 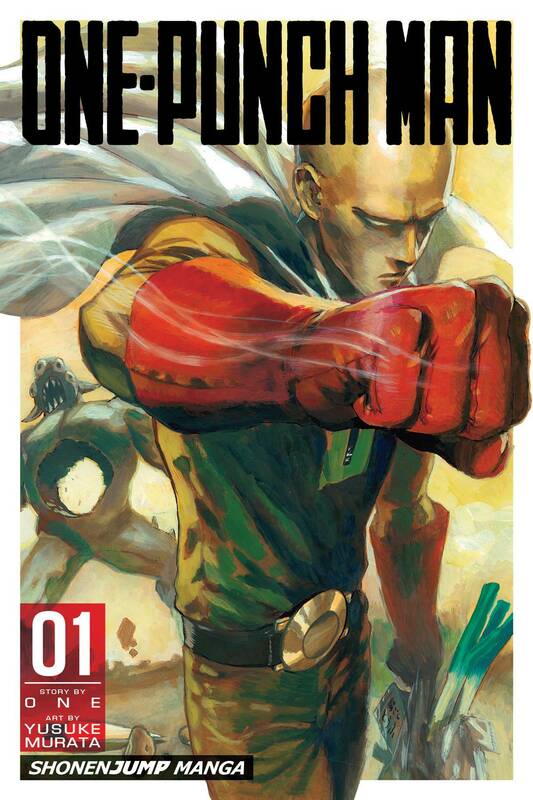 Then, sometimes, you get a book that can knock you out with one punch: enter the One-Punch Man. Written by ONE and art by Yusuke Murata, the book focuses on Saitama, a young man who is a hero “for fun” and has a really unusual problem: after training hard for three years, he can now beat anyone with one punch. Oh, and he trained so hard he literally lost his hair. So now, Saitama seeks to find a foe that can put up a challenge, that can make him feel something. Sounds like a pretty heavy book- but what it really is: an action packed, humor filled gorefest that bounces off the wall at every page. In this first volume, we see quite a few menacing monsters, and we see how cool one punch can really look throughout the book. We also get to see the day Saitama decided to stop going along with the corporate world and become the hero he always wanted to be: hint- it involves a monster lobster. The artwork is amazing- so much detail and expression through the black and white artwork, Murata illustrates this zany world perfectly. From the somewhat bland look of our hero to the menacing details we see in the form of monsters and giants, not to mention the kinetic energy that comes from the titanic battle scenes- the artwork is simply awe inspiring. I had no clue what I was getting into with this book- I’m just glad I decided to pick up volume 2 at the same time. One-Punch Man is an amazingly fresh take on superheroes, and Saitama is a new “every man” hero we want to root for. I loved the book, from cover to cover, and I am now eager to read the next volume. Rating: I give One-Punch Man Volume 1 a perfect 5 out of 5.